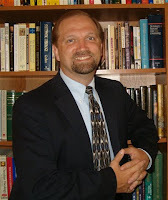 The Graduate School in Counseling and Interpersonal Relations at Grace College, Winona Lake, Indiana, will sponsor psychologist and author Dr. Bob Kellemen (pictured) to present a lecture Wednesday, February 6, based on his book Beyond the Suffering: Embracing the Legacy of African American Soul Care and Spiritual Direction. Kellemen will be speaking in the Social and Cultural Issues Class on Wednesday, February 6, 2008, from 6-8:50 p.m. in Mount Memorial 007. All are cordially invited to come and hear the heart and wisdom of Dr. Kellemen on a very important topic. Robert W. Kellemen, Ph.D., LCPC, is chairman of the Master of Arts in Christian Counseling and Discipleship Department at Capital Bible Seminary, the Founder of RPM Ministries, and the author of Soul Physicians, Spiritual Friends (both published by BMH Books of Winona Lake), and Beyond the Suffering: Embracing the Legacy of African American Soul Care and Spiritual Direction. Kellemen has pastored three churches and serves as the co-director of the American Association of Christian Counselor’s Biblical Counseling and Spiritual Formation Network. He has been married 26 years to Shirley. They have a son, Josh, who is 22, and a daughter Marie, who is 19. You can learn more about Kellemen and read his blog at www.rpmbooks.org.